Your tibia (or shin bone) and fibula are the two long bones in your lower leg and are important parts of your knee and ankle joints. This page explains what happens when you break (or fracture) one or both of these bones in the middle. There are separate pages about a broken ankle or broken knee. The tibia is the larger bone, and supports most of your weight. It is also the most common long bone to be broken. One or both of the bones can break. Because it takes a lot of force to break a long bone, it often happens with other injuries. Your injury might also involve the knee joint at the top of your bones or the ankle joint at the bottom. See broken bones first aid. How does a lower leg bone break? High-energy collisions, such as a car or motorcycle crash, and sports injuries, such as a fall while skiing or running into another player during rugby, are common causes of a broken lower leg bone. Weak bones (for example, in someone with osteoporosis) tend to break more easily. 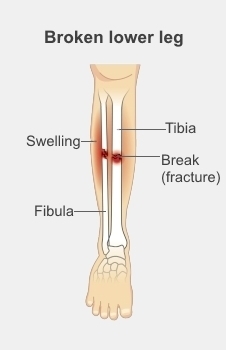 Your lower leg bones can break in many different ways, and some breaks are worse than others. How bad a break it is depends on how many pieces a bone breaks into, whether they are stable or move around a lot, and whether the broken ends of the bone are still in the right place. If you have an open fracture, this is particularly serious. An open fracture means bits of bone are sticking out through your skin, or a cut or gash goes all the way down to your bone. Once your skin is broken, you are more likely to get infection in your wound and bone. You need to be treated immediately to stop this from happening. How do I know if I have broken one of my lower leg bones? you may lose feeling in your foot. If you think you may have broken your lower leg it is important to see a doctor or nurse practitioner. They will ask about how your injury happened, look at your leg, and take X-rays to find out which bone is broken and what kind of break it is. They may also X-ray above and below where you are sore, to check if you have any other nearby injuries. Occasionally, people also have a CT scan, which can show a complex break more clearly.